Since A.D. 2008, the Federal Reserve has paid $2 trillion dollars into the economy in order to avoid a recession or depression, inflate the money supply, and thereby “stimulate” the economy back to recovery and robust health. Strangely, while that $2 trillion has apparently prevented an economic depression, it hasn’t caused an economic recovery. Despite the added $2 trillion, our economy is more-or-less right where it was back about A.D. 2008. The Fed didn’t get much bang for its bucks. How could $2 trillion in “stimulus” cause in so little stimulation? The Elliot Wave article explained, in part, that the Fed’s $2 trillion was paid to Wall Street banks in return for “toxic assets” previously held by the banks. The banks were supposed to lend that $2 trillion to customers and thereby stimulate the economy. However, the American public didn’t want to go deeper into debt, refused to borrow that currency, and so the $2 trillion (most of it) simply sat in the bank vaults, leaving the economy largely “un-stimulated”. I don’t doubt that public reluctance to go deeper into debt after A.D.2008 was at least part of the reason we’ve not yet seen significant inflation or an economic recovery. The banks can’t make the public borrow. But I suspect there may be another reason that, so far, has been generally overlooked: Maybe the Wall Street banks couldn’t lend the $2 trillion to the public. However, the Elliot Wave chart had no color. It treated all of the Fed’s “assets”—both before A.D. 2008 and after—as of equal quality and value. It didn’t distinguish between the “assets” owned by the Fed prior to A.D. 2008, and the “toxic assets” purchased by the Fed after A.D. 2008. As you can see, the Fed’s assets increased slowly from around $600 billion in A.D. 2000 to $900 billion in A.D. 2008. Then, based on the economic crisis of A.D. 2008, the Fed started to increase its assets at an astonishing rater, rising from $900 billion in 2008 to over $2 trillion in early 2009, and then continuing to purchase more “assets” until the Fed’s balance sheet is today around $3.2 trillion. The Fed’s balance sheet jumped from $900 billion to $3.2 trillion in just five years. Based on this post-2008 growth, the Elliot Wave article declared that the “Fed has been inflating at a 33% annual rate for 5 years.” By buying these $2 trillion in “assets,” it’s believed that the Fed added an additional $2 trillion in cash to the money supply. This additional $2 trillion should’ve caused significant inflation and also stimulated the economy. Does the chart really show the “value” of Federal Reserve “assets”? Or does it only show the “price paid” for those assets? The Elliot Wave chart is based on the presumption that the $2 trillion price paid by the Fed for “assets” purchased since A.D. 2008 equates to those assets’ current free market value. I don’t think so since the post-2008 growth in the Fed’s balance sheet has been achieved in large measure by purchasing “toxic assets” like mortgage-backed securities and US Bonds. I suspect that in order to maintain the illusion that these “toxic assets” were still valuable, the Fed paid full (or nearly full) face price for “toxic assets” even though their true, free-market value might be 20% to 90% less. I suspect that the Fed’s $3.2 trillion “balance sheet” reflects the price paid rather than the current free market value of whatever “toxic assets” were purchased. If my suspicions are correct, it’s possible that, although the Fed’s current balance sheet is “priced” at $3.2 trillion, its real, free market value might be closer to $1.4 trillion. If so, the real value of the Fed’s balance sheet might be less than half of what’s currently claimed. Has the Fed truly been inflating the supply of dollars by 33% per year? I’m not convinced. It’s not enough to merely print $2 trillion in “extra” currency and then squirrel it away in a bank vault. If that currency is going to cause inflation (and economic stimulus) that currency has to actually enter into circulation in the free market. More, what’s the real effect of printing additional money that’s used to pay full price for securities that may have lost 90% of their value? Is the Fed really adding to the money supply if it prints an extra $2 trillion (cash) that’ll be used to buy $2 trillion (face value) in “toxic assets” that are now worth, say, only $200 billion? These questions are especially interesting because, once purchased, the “toxic assets” are then taken out of the free market and squirreled away in some Federal Reserve hidey hole. The total money supply in A.D. 2007 was, say, $10 trillion (again, a purely hypothetical and arbitrary number chosen only to illustrate a theory). That money supply included not only cash and checking account deposits but also other paper “assets” such as mortgage-backed securities and US bonds. Under fractional reserve banking, many of these paper assets were held in bank vaults as collateral to justify lending ten times as much to US and foreign consumers so as to keep the US and global economies humming. To illustrate, let’s suppose that out of the fundamental money supply of $10 trillion, there was $4 trillion held in the banks as collateral sufficient to justify the banks’ creation and lending of as much as an additional $40 trillion into the US and global economies. Let’s suppose that in A.D. 2008, about $2 trillion of the $4 trillion in “assets” held by the banks were suddenly valued at only $200 billion—in large part because of mass defaults on the mortgages underlying “mortgage-backed securities”. Since their face value had plunged from $2 trillion to, say, $200 billion (90% loss), these former “paper assets” were now deemed “toxic assets”. Why “toxic”? Perhaps because they were owned by banks and used as collateral for fractional reserve banking loans. If so, when the $2 trillion in “paper assets” (that had already justified the creation and loan of $20 trillion into the US and global economies) became “toxic assets” worth only $200 billion, they could no longer justify the previous creation and loan of $20 trillion into the economies. This implies that the previous “assets” were labeled “toxic assets” because they might force the recall of most of the $20 trillion in previously “created” and loaned currency into the economy. A call-in of $20 trillion in loans would almost certainly collapse the US and global economies. 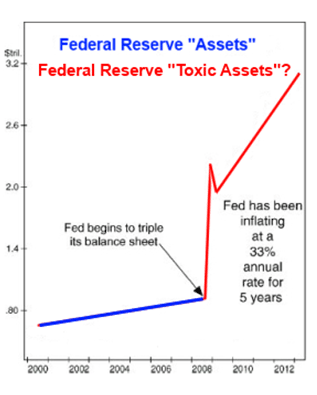 In order to prevent the “toxic assets” from precipitating an economic collapse, the Federal Reserve offered to purchase “toxic assets” (now, worth only $200 billion) for all or most of their original face value of $2 trillion. By replacing their $2 trillion (face value) in toxic assets with $2 trillion in Federal Reserve Notes (cash), the banks once again had sufficient “paper assets” in their vaults to justify the $20 trillion they’d previously loaned out. Result? By swapping $2 trillion in cash for $2 trillion in “toxic assets,” the banks were able to avoid calling in $20 trillion in previous loans. That swap was good because it kept the economy from collapsing. That swap wasn’t “stimulating” because it didn’t actually add more currency to the money supply. The swap prevented or at least forestalled the Greater Depression, but it did not stimulate the economy to grow. Because, in order to sustain the lie that the “toxic assets” were still worth all or most of their $2 trillion face value, those toxic assets had to be pulled out of the free market and hidden away in Troubled Asset Relief Program (“TARP”) accounts and/or the Fed’s balance sheet. By removing those toxic assets from the free market, the government and Federal Reserve prevented the free market from openly pricing those “toxic assets” at prices far below their $2 trillion face value and thereby proving that those toxic assets were almost worthless. Thus, although the Federal Reserve added $2 trillion in freshly-printed paper-dollar “assets” into the economy, the government and Federal Reserve also subtracted $2 trillion (face value) in “toxic assets” from the economy. The government and Fed prevented a collapse but—contrary to what most people suppose—they didn’t cause a net gain of $2 trillion to the money supply and therefore didn’t “stimulate” the economy. Because most of the $2 trillion paid out by the Fed has remained in the Wall Street bank vaults, there’s been little actual gain in the supply of dollars that are in circulation. Therefore, there’s been little “stimulation” or inflation, and no economic recovery. Instead, our economy has more-or-less stagnated in the same place that it was in A.D. 2008. • Is the previous speculation exactly correct? Of course not. The numbers I used are arbitrary. The “math” is overly simplistic. The entire analysis is intended only to illustrate a fundamental hypothesis: If the Fed added $2 trillion in paper-dollar “assets” to the money supply but also subtracted $2 trillion (face value) in “toxic assets” from the money supply, there was no increase in the money supply, no stimulation and therefore no economic recovery. Is this fundamental hypothesis true? 1) Since A.D. 2008, the big Wall Street banks received roughly $2 trillion from the Federal Reserve. 2) That $2 trillion was supposed to be loaned to the American people in order to “stimulate” the economy. 3) But, instead of lending $2 trillion to the American people, the banks kept almost all of it ($1.8 trillion) in their vaults. 4) The government and Fed must’ve known that the $2 trillion was being retained in bank vaults, not reaching the public and therefore having little or no “stimulative” effect on the economy. Nevertheless, the government and/or Federal Reserve made no serious attempt to force the banks to lend the entire $2 trillion to the American people. Doesn’t that strike you as strange? If all of that $2 trillion had been loaned out into circulation, we might’ve had our “recovery” and the US economy might be smokin’ hot by now. If the real purpose for paying $2 trillion to the banks was to lend that money to the public and thereby stimulate the economy, why did the government and Federal Reserve allow the banks to “sit” on all that cash, not lend it, and therefore not stimulate the economy? What does the failure to get the $2 trillion into the hands of the public imply? 1) The gov-co never really intended to stimulate the economy? That gov-co didn’t force the banks to lend the $2 trillion because gov-co wants the economy to stagnate or collapse? 3) The Fed gave the banks $2 trillion in paper-dollar “assets” only to replace the $2 trillion that had become “toxic assets”? That the Fed thereby prevented the massive, unsustainable “call-ins” of up to $20 trillion in pre-existing loans that would almost certainly have collapsed the US and global economies? That the $2 trillion loaned to the banks couldn’t be loaned to the public, and couldn’t be used to stimulate the economy, because that $2 trillion had to remain in the bank vaults in order to support the $20 trillion that had already been loaned out under fractional reserve banking? Given the fact that most of the $2 trillion received by the banks was never loaned into the free market and therefore never stimulated the economy, which of the three possible explanations seems least likely? Which possible explanation seems most plausible? I think # 3 is plausible. The Fed didn’t add $2 trillion to the money supply. They merely replaced $2 trillion that had previously “disappeared” when some “assets” became “toxic assets”. Result? No collapse (yet). Only a fraction of the inflation we might otherwise have expected. And also, no recovery. Instead of stimulation, we’ve mostly had stagnation. Join Laurie Roth each day as we take on these and other issues from 7-10pm PAC at www.therothshow.com. Last week H.R. 3350 was introduced in the HOUSE and has been in Committee being bantered around. Now a twitter is going around saying that this bill will get a vote. It was introduced by Fred Upton (R-Mich) and has 88 cosponsors so far. The Bill is in response to the endless lies made by Obama saying that we can keep our insurance plans and Doctors. Obama has made this statement in various ways dozens of times over the last 3 years. No wonder Obama’s poll numbers continue to go down down and down. His lies are everywhere and spread like wildfire. You could open an ‘Obama-lie’ museum and walk for days to get through each exhibit. What a sad legacy. What really has been happening is that Insurance companies aren’t ‘keeping the people.’ They have been forced to drop millions of clients because most cannot and will not comply with Obama’s healthcare plans, restrictions and costs. So yes…we can certainly keep our health insurance plans all right — they just can’t keep us. Perfectly, the insurance companies are then the bad guys when they drop everyone…not Obama. H.R. 3350 is a much needed stop gap and finger in a bursting damn to allow insurance companies to keep going with their current plans and keep insuring their clients. Given the amount of pain, loss and sticker shock experienced by everyone – liberal and conservative, this must pass the HOUSE and the SENATE. It is critical that in the next few weeks’ massive pressure is put all over the HOUSE and SENATE to make this Bill pass. H.R. 3350 will be much needed CPR for America and will breath life blood into dying insurance companies. It will give health care options and policies back to the people. Let those who vote against this be known far and wide. This is NOT political but a real plan to offer up desperately needed relief to the masses. It will return what in truth were stolen health care plans from millions – Just as Obama had planned. So far, a few Democrats are behind this type of bold move in the Senate. These include Mary Landrieu (D-La.) and Joe Manchin (D-W.Va.) As unpopular as Obamacare is and as incompetent as the exchanges have actually been, the Democrats and Republican establishment had better wake up and smell the 2014 coffee. The masses are burning with anger and boldly suffering…including the liberal masses that are also being dropped from policies left and right. Email, call and Fax your Representatives and Senators and demand they get behind H.R. 3350 and then continue fighting the Obamacare monster until it is dead. HOUSE leaders of any substance…must continue bringing Bills like this up for a vote, then they must make sure all media blasts out the voting record. There is ZERO excuse for not voting for H.R. 3350. The HOUSE must focus and stay ahead of the message! I strongly believe no matter what Obama’s lying-progressive plans are for Americans, the growing masses of all shapes and sizes are trusting Obama less than ever before. If he continues the way he is going he will be standing on a postage stamp of his support base. The HOUSE and SENATE had best forget what the Democrats and Republicans are dictating and listen only to what the people are saying. Smell the 2014 coffee and vote YES on H.R. 3350. Join me each day as we take on these and other issues from 7-10pm PAC at www.therothshow.com. Most voters want a long-term budget deal that cuts federal spending but expect another government shutdown soon because Congress can't reach such a deal. Just 15% of Likely U.S. Voters favor a federal budget that increases spending, according to a new Rasmussen Reports national telephone survey. Fifty-four percent (54%) prefer a budget that cuts spending instead, while 25% want one that keeps spending levels about the same. I think more Americans are coming to the conclusion that they were scammed by their government and supported the political agenda because they were "motivated by decency." Politicians convinced Americans that they can fix the banking and housing market problems and more people will own their own home. The opposite happened. Politicians convinced Americans that they can fix the healthcare system to make it more affordable and more people who had no coverage will have healthcare. What has happened is affordable healthcare was taken away from the middle class and given to the poor and uninsurable. I predict that physicians won't get paid under Obamacare because we have a lying leader who has no national budget and takes no responsibility. I know, I know this picture is so huge, so devastating and so unthinkable that some folks can't see it or don't want to. So, let's put the scam into context a little closer to home. Let's say you want to sell your car and you list it for sale. You are contacted right away by several people you think are interested buyers. You agree on a price ($5,000) and start the process of making arrangement for payment and processing the Bill of Sale. This is when things get a little slippery because your buyer wants to ship the car out of state and has arranged for a third party with power of attorney to sign the documents and take possession of the car. However, you insist that you be paid first. The buyer says, "No problem." I will send you a cashier's check drawn on a US bank. That sounds ok and you agree. The check arrives but it is for $7,900. Did the buyer make a mistake or does he think your car is worth more? After you deposit the check, you learn that the third party agent needs to be paid $2,900.00 for his trouble and then he will sign the Bill of Sale and take the car. So, you take $2,900.00 out of your account, pay him, he signs the Bill of Sale and takes the car (out of state somewhere). Your bank notifies you later that the check was not good and you've lost $2,900.00 and you car. Welcome to the Affordable Care Act because politicians are generous with other people's money. Americans have been conditioned for years to believe that they are just one healthcare mishap from huge medical bills and bankruptcy. Therefore, Americans held their healthcare in high esteem. If the government tells them they can make their healthcare coverage cheaper and more accessible then why not go along with it and the money saved will allow for a cable upgrade and maybe get a newer car. Instead, they were scammed and are paying God-awful amounts for health insurance that isn't as good as their old insurance plan and they can't afford basic cable or a newer car. I think the best that could be said about Obama and his healthcare scam is that he mislead Americans. The definition of mislead is to deceive and to lead into wrongdoing. Was Obama lying to Americans in order to protect them from their own stupidity? Politicians actually believe that. America didn't have a healthcare crisis until the Affordable Care Act materialized. To willfully lie to someone about the very nature of their health and wellbeing is despicable and criminal. So, what can you do? You can't afford $5,000 or more in health insurance premiums with a $5,000 deductable. Well, you can either go along with the scam and pay out the nose or fight back with legal options. But what about the major medical issue for catastrophic events? Even the health insurance catastrophic insurance is horribly expensive. If health care insurance is bound by the Affordable Care Act on what they cover, why would anyone enter into an agreement with a government which misleads its people? Fortunately there is a way and it is seen as a legal option under the Affordable Care Act and there is no penalty. I know of several families who have cancelled their new inflated healthcare plans, have ignored the exchange site options and have decided to pay for their common cold and flu events out of pocket. There is a community of over 1 billion Americans that have joined together to help each other with major medical expenses but it is voluntary. It is based on the godly principle taught in Galatians 6:2 and Acts 2&4. I encourage you to investigate this option http://www.chministries.org. So, now that you've solved the major medical catastrophic part of healthcare what can you do regarding reducing cost and risk associated with colds, flu, allergies, various infections and drug dependency? There are powerful and natural options to strengthen your body to resist viruses, bacteria, allergic pathogens and system failure. Are your kidneys, heart or liver at risk? Why not strengthen them without drugs. Call Apothecary Herbs to find out how you can cleanse the body of harmful toxins and lethal pathogens and rebuild your immune system to be 1,000 times stronger than the average American. Call now for a free product catalog 866-229-3663, International 704-885-0277 online http://www.thepowerherbs.com, where your healthcare options just became endless. Cold & flu season is here so don't forget to stock your organic whole food vitamins and immune boosters and save 15% on orders of $45 or more with coupon THKG13. Hurry! Expires 11/9/13. For those on a budget, check out the MY 3 Amigosproduct to ward off bacteria and viruses. If you want to stay healthy or get healthy, a hospital is the very last place you want to find yourself. Most hospitals are filthy places that are infested with antibiotic-resistant superbugs, serve disease-promoting foods, and lack vital sunlight. And multiple studies now show that potentially deadly mistakes with drugs or surgical procedures appear to be frighteningly common in US hospitals. No, I'm not talking about emergency rooms. If I had a severed hand, I would get to the emergency room as fast as possible and hopefully the doctor would be able to reattach the hand. Emergency room physicians do amazing jobs and oftentimes are paid only a fraction of what the "specialists" are paid, so I'm not knocking them at all. What I'm talking about is treatment for chronic, degenerative disease. "Iatrogenic" means "caused by medical treatment." The term "iatro" comes from the Greek word "iatros" for medical or medicinal. Iatrogenic death occurs when people die due to errors or negligence by doctors. The reported yearly death rate from medical error is over 120,000. This compares to around 44,000 deaths from motor vehicles and only a few hundred from commercial aviation. You should be far more worried about dying in a hospital than from an airplane crash. The Nutrition Institute of America funded an independent review of "government-approved" medicine that was published in 2006. Professors Gary Null and Dorothy Smith, along with doctors Carolyn Dean, Martin Feldman and Debora Rasio titled the report "Death by Medicine." In this report, the researchers found that America's leading cause of death isn't heart disease or cancer: its conventional medicine. They found that the iatrogenic death rate in the USA (death caused by doctors and/or medical treatments) is 783,936 a year! In comparison, there are only 31,940 deaths by firearms each year, 19,766 of which are suicides. So what's behind these death rates from adverse events? Profit and politics – plain and simple. In the words of Robert Scott Bell, modern medicine has become nothing more than the "Church of Biological Mysticism." I couldn't agree more. And the deadly nature of this pseudoscientific "church" is made crystal clear whenever there is a doctor's strike. In 1976 in Bogota, Columbia, there was a 52 day period in which doctors disappeared altogether except for emergency care. The death rate went down 35%. There was another doctor's strike during 1976 in Los Angeles. The death rate dropped 18%. During 1973, there was a doctor's strike in Israel. The death rate dropped 50%. A 2008 review published in the prestigious journal, Social Science & Medicine, analyzed five separate incidents in which doctor strikes led to decreased mortality. Awkwardly, they also attempted to blame the lack of elective surgeries, but in the end, they were forced to admit that "the literature suggests that reductions in mortality may result from these strikes." Are you getting the picture? Doctors are dangerous! It looks like the best way to reduce deaths may be to fire the doctors. Statistics show that the average doctor is approximately 24 times more deadly than the average gun owner, and that an average doctor has a 17% chance of killing at least one patient, every single year. Remember George Washington? Throughout his life, he only used what is now known as "alternative" medicine, until the last day of his life. He was apparently in so much pain that he finally allowed the high priests of the "Church of Biological Mysticism" to try a new "scientific" procedure on him called "bloodletting." It took them less than 24 hours to finish him off with their quackery. Just because something is considered to be "common medical practice" doesn't mean that it's been proven effective. The Office of Technology Assessment (OTA) was created by Congress to analyze scientific and technical issues in America. From 1972 to 1995, the OTA conducted studies on health care and related topics, but they crossed the line when they produced an "unfavorable" report on the US healthcare system. As a result, the OTA was promptly disbanded. Why? You don't expect the government to fund an organization that is honest, do you? C'mon, especially when that honesty damages the multi-billion dollar healthcare industry. Wake up to the tyranny. Velcome to Amerika! In 1978, the OTA issued a major research report that concluded "only 10 to 20 percent of all procedures currently used in medical practices have been shown to be efficacious by controlled trial." Want me to translate that for you? This means that between 80% and 90% of what doctors do to you is scientifically unproven guesswork. By the government's own definition, according to this OTA report, the majority of conventional medicine is "quackery." While the popular belief is that the US healthcare system is the best in the world, it's actually more like the "wild west." Did you know that in most states, it is illegal for a doctor to recommend any vitamin, nutrient or food for the prevention or treatment of any disease? Doing so can cause a doctor to have his medical license permanently revoked. How irrational and archaic is that? Care (not treatment) is the answer. Drugs, surgery and hospitals become increasingly dangerous for chronic disease cases. Facilitating our God-given healing capacity by improving our diet, exercise, and lifestyle is the key. Bottom line: Unless you really need immediate critical care, try to avoid doctors and hospitals. First of all, I want to let you know about an excellent source of many very good DVD's which you can purchase for $2 each, and then make copies to share with others: http://onedollardvdproject.com. I have given permission for my lecture "Inoculations the True Weapons of Mass Destruction" to be added to the list of available DVD's (this lecture can also be viewed athttp://www.youtube.com/watch?v=M6dffXhewVE; the diagrams I describe in the lecture can be printed out at http://www.reversingvaccineinduceddiseases.com/page/414591608). The first diagram, "the big picture", has the cause of ALL disease on one sheet of paper. As the masses are coming out of their mind control and looking for information as to all the lies we have been told, sharing various DVD's on different subjects are making a huge difference in this process. Use discernment in evaluating ALL information (including mine); we have been lied to about everything, and there are many disinformers out there trying to mislead the awakening masses. Figuring out who is who in the zoo is a lesson in critical thinking, which is necessary for our very survival at this point in time. Once we have realized that we have been lied to about EVERYTHING (and in fact are being killed and maimed INTENTIONALLY by vaccines, GMO food, chemtrails, toxic pharmaceutical drugs, ad infinitum), there comes the point where we must face the self evident truth that we are ALREADY DEAD if we do nothing. A sure sign of a disinformer/minion is one who instills fear by exposing various atrocities, but then gives NO SOLUTIONS or tells people there is NO HOPE. The protocol I teach my clients all over the world is able to reverse all diseases in internal medicine, in people and in pets. Of course, one has to be willing to do what must be done, especially getting off the killer drugs. But one thing we have been sorely lacking is a plan to deal with the treason being committed by the psychopaths causing the destruction of everything that matters. So now I will continue exposing how bad it is. This first item is an example of how we live in "opposite day"; where everything is the opposite of what really is. : "Conspiracy Theorists Are the Greatest Challenge to Democracy According to British establishment mouthpiece BBC": http://rinf.com/alt-news/breaking-news/conspiracy-theorists-are-the-greatest-challenge-to-democracy-according-to-heres-who/ . An important TRUTH you will find here is that "those who challenge the establishment are also challenging the core of Freemasonry". Did you know that the 1st third party in this country was the anti-masonic party? [http://www.u-s-history.com/pages/h271.html ] Almost all of the "founding fathers" were freemasons, which is why the constitution does not apply to regular citizens, as has been stated in many court decisions where citizens claim their "constitutional rights" have been violated. (Such decisions actually state that "constitutional rights" can not be claimed as ordinary citizens were not a party to the constitution). To learn about this huge fraud on the people, watch "America's Secret Destiny" by Ralph Epperson at https://www.youtube.com/watch?v=wmOit3B1vKs . It will help you see why "constitutional professor" Barack Obama has executive ordered us into complete tyranny under our present police/surveillance state. THE JOKE IS ON US! Another atrocity under Obamacare can be discovered at http://nationalreport.net/rfid-mascot-chippie-nationwide-tour ; RFID Mascot Begins Nationwide Tour To Help Alleviate Children's Fears Of Implantation. "In an effort to separate myth from truth regarding the federally mandated Obamacare RFID chip implantation program, a public awareness campaign has been launched to tour in a number of public schools across our nation. The operation features a jovial animated mascot, a cartoon RFID chip named "Chippie". They use the character to demonstrate to their young audience the benefits of having the RFID implanted under your skin." THE MARK OF THE BEAST HAS BEEN MANDATED BY OUR PSYCHOPATH IN CHIEF. Will you stand up and say NO? If you need help in reversing your disease with natural therapies. please go to http://www.reversingvaccineinduceddiseases.com/servicesto learn how Dr. Carley does consults. (Note that Alzheimers can also be reversed as long as there is family available to give the person their remedies). You can access many archives of internet shows Dr. Carley has done over the last few years at http://thelightofdayradioshow.com/archives/RBN-BACKUP/commercialFree.html.